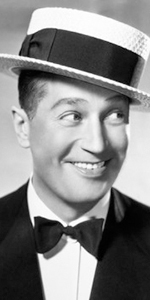 Maurice Chevalier was an early sound era star, whose long career of films, recordings, songwriting, personal appearances in nightclubs and cabarets, made him (for America anyway) the very symbol of France and French joie de vivre. Apprentinced to his house painter father in the building trades, Chevalier began singing for tips in a café. By 1901, he tried out for a local musical, and got the part. Eventually forming an act at the l'Alcazar cabaret in Marseille, his debut in Paris was a sensation. Chevalier always appeared in tuxedo with cane, wearing a staw boater hat. His relaxed songs and manner of singing them instantly put people in a receptive mood. In 1909, Chevalier began touring with the singer Frehel, but drug and alcohol problems on her part broke up the act by 1911. 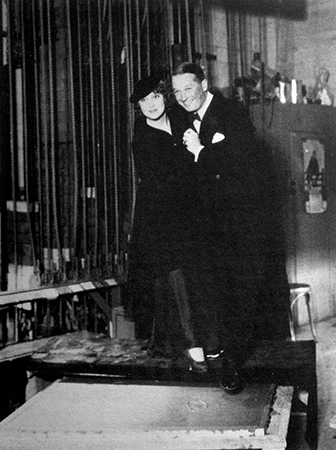 He then took up a partnership on stage and off with Mistinguett at the world-famous Folies Bergere in Paris. Drafted into the French Army at the beginning of World War I, Chevalier was wounded in the back, captured and was captured by the Germans. Mistinguett had an admirer in King Alfonso XIII of Spain; she asked the King to use his influence with the German royal family to release Chevalier; he returned to France just in time to begin entertaining American soldiers at le Casino de Paris. Chevalier had learned English while a POW in Germany, which put his at a distinct advantage with British and American troups. He played a successful gig at the Palace Theatre in London. After the war, Chevalier returned to Paris, always performing and creating new songs. He appeared in several films, including Le mauvais garçon "Bad Boy", where he played the title role for director Henri Diamant-Berger in 1923. In 1921, he made a huge impression in the operetta Dede — so successful, that Gerge Gershwin and Irving Berlin brought the show and its star to Broadway in 1922. It was her that he met the dancer Yvonne Vallee. The couple married in 1927. Chevalier signed a contract with Paramount Pictures in 1928. His first film for them was Innocents of Paris (released in May, 1929) with Sylvia Beecher for director Richard Wallace. His first musical film with director Ernst Lubitsch was The Love Parade with Jeanette MacDonald (released in January, 1929. Chevalier's impact in this film was such that he was nominated for the Best Actor Oscar, which also happened for his next film, The Big Pond with Claudette Colbert (released in May, 1930). Audiences were dropping off for musicals by 1931, but Chevalier managed to put The Smiling Lieutenant (released in August, 1931) with Claudette Colbert over, showing execs that it was personalities which sold musicals. Paramount teamed Chevalier up with singer Jeanette MacDonald, and they made both One Hour with You, directed by Ernst Lubitsch and George Cukor (released in March, 1932), and Love Me Tonight , directed by Rouben Mamoulian (released in August, 1932). Switching to Metro-Goldwyn-Mayer, the Chevalier / MacDonald team made The Merry Widow, again for director Ernst Lubitsch, which was playing the night the Chevalier / MacDonald imprinting ceremonies were held onstage. This time, the blocks were successfully transferred to the forecourt (unlike the Jean Harlow imprinting), but with few exceptions, the habit of remote imprinting was not been done much until more recently. Drifting back toward Europe, Chevalier continued to headline in pictures up to the beginning of World War II: Folies Bergere de Paris (which played the Chinese in March, 1935), The Beloved Vagabond (released in May, 1936), L'homme du jour (The Man of the Hour - released in January, 1937), and finally, Piéges (Personal Column - released in December, 1939). He had married another dancer, Nita Raya, and was popular in clubs and revues, as well as recordings. During World War II, Chevalier continued to perform during the Nazi occupation. A notable performance was before French POWs at the same camp he had been held captive during World War I. This led to charges of collaboration by the press at war's end, but a French court cleared him of the charge. After this, Chevalier began to mellow somewhat. 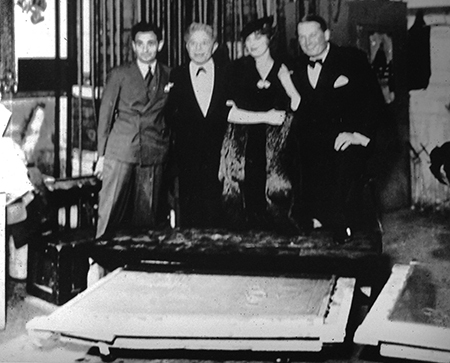 He continued to be a popular entertainer, but he bagan his memoirs and took up painting. He became an advocate of nuclear diarmament. After the HUAC affairs had cooled, director Billy Wilder had him star in Love in the Afternoon (released in June, 1957). His gallic take on an older, wiser avuncularity was perfect for the musical Gigi (released in May, 1958) where he introduced what became his theme song, "Thank Heaven for Little Girls" and which remains his most enduring role. Chevalier was given an Honarary Oscar that year. Later films included Can-Can (released in March, 1960), A Breath of Scandal (released in March, 1960), Fanny (released in June, 1961), In Search of the Castaways (released in December, 1962) and Monkeys Go Home! (released in February, 1967). Maurice Chevalier was enough of a draw to star in his own one-man musical concert shows on Broadway in 1930, 1932, 1947, 1948, 1955, 1963, and 1965. He announced his farewell tour in 1968. He sang some songs for the animated Disney film The Aristocats (released in December, 1970). He published a second (or is it fourth?) autobiography, I Remember it Well in 1970. He died in 1972 at the age of 83. Grauman's Chinese Theatre, Hollywood, California. Maurice Chevalier and Jeanette MacDonald imprinting ceremony, Thursday, December 4, 1934. MacDonald helps Chevalier into his cement.